Further Edit: Additional remarks, referring to Hudson and Hili, were made by the Court of Appeal in Russell v The Queen  VSCA 147. A sentencing judge is required to have regard to, inter alia, current sentencing practices and accordingly will take into account in the instinctive synthesis of relevant sentencing considerations statistics relating to sentences imposed for the offence and the results in comparable cases. Counsel for the appellant in this case placed statistics at the forefront of his case and subjected a number of other sentencing decisions to a detailed analysis. Counsel pointed to aspects of other cases said to disclose more serious offending than the present case and relied upon lesser sentences in those cases to argue that the judge in the present case erred. In my opinion, such an approach is misconceived. Cases said to be comparable can do no more than provide a general guide, impression or background. They are not a benchmark that acts as a straightjacket. Further, such an approach runs the risk of adding or subtracting periods of time to reflect aggravating and mitigating factors present or absent in the cases being compared. As Kaye AJA has explained, statistics are an even rougher guide to an appropriate range. Edit: Although the High Court was careful to specifically limit its observations about sentencing to federal cases, Hili & Jones has already been taken up and referred to by the Victorian Court of Appeal in support of general sentencing principles. In Hudson's case, handed down last Thursday, one of the arguments raised attacked the non-parole period as being unjustifiably high when compared with other cases. The Court comprehensively rejected the use of sentencing statistics as anything more than a guide. The applicant sought to demonstrate, by reference to a number of ‘worst’ category cases of murder including R v Denyer  1 VR 186, R v Beckett, Director of Public Prosecutions v Adajian, R v Debs & Roberts, and R v Williams, that the non-parole period should not have been greater than 30 years. Aggravating factors were identified in some of those cases which were absent in this case, yet the offender in those cases received the same or a lesser sentence. In other cases said to be equally serious, a lower sentence was imposed. Counsel acknowledged that the sentencing judge had been taken to a number of these cases to establish where the applicant’s case fell in comparison with those cases. The submission was unsound for two reasons. First, comparable cases may not be used for the purpose of trying to identify a sentence that is a fair comparison with the circumstances of the instant case. Second, the sentence under challenge will not fall outside the range because there are other types of ‘worst’ cases arguably more serious which have attracted the same penalty or cases no less serious which have attracted lesser penalties. The selection of a sentence involves the exercise of a judicial discretion which is informed by the circumstances in which the offence was committed and the character, antecedents and conditions of the offender. It is not possible to say that a sentence of a particular duration is the only correct or appropriate penalty to the exclusion of any other penalty. The method of instinctive synthesis will by definition produce outcomes upon which reasonable minds will differ. For that and other reasons, counsel are precluded from submitting that a specific sentence should be imposed. Sentences imposed in ‘like’ cases provide some indication of the range that is open in the proper exercise of the discretion: Hili v The Queen  HCA 45 (Unreported, French CJ, Gummow, Hayne, Heydon, Crennan, Kiefel and Bell JJ, 8 December 2010) -; R v Shepherd  NSWCCA 287; (2003) 142 A Crim R 101, 17. They will indicate, subject to relevant discretionary considerations, the order of the sentence that might be expected to be attracted by a certain type of offender who commits a certain type of offence. A general overview of sentences imposed for offences of a similar character will play a part in informing the ‘instinctive reaction’ when a court is asked to consider whether a sentence is manifestly inadequate or excessive. They are an indicator of ‘current sentencing practices’ which is one factor that the court must consider under s 5(2) of the Sentencing Act 1991. By facilitating the identification of the range, similar types of cases serve the criminal justice objective that sentencing should be systematically fair and consistent. They advance the underlying value of equality under the law. ‘Like’ cases can only, at best, provide a general guide or impression as to the appropriate range of sentences: R v Jimmy. In that context it has been said on many occasions that ‘comparable cases’ can only provide limited assistance to this Court: R v Price (Unreported, Supreme Court of Victoria, Court of Criminal Appeal, Crockett, O’Bryan and Gobbo JJ, 14 April 1987); DPP v Maynard  VSCA 129 (Unreported, Ashley, Redlich and Kellam JJA, 11 June 2009) -; DPP v Moore  VSCA 264 (Unreported, Neave and Redlich JJA and Lasry AJA, 24 November 2009) ; WCB v R  VSCA 230 (Unreported, Warren CJ and Redlich JA, 10 September 2010) . They may however be used in search of unifying principles: Hili v The Queen  HCA 45. That was not the use to which counsel sought to employ them here. Before both the sentencing judge and this Court, cases said to fall within the same category were examined in some detail to demonstrate which cases were or were not a fair comparison with the present case. That analysis, it was submitted, warranted the conclusion that a sentence of no more than 30 years was the correct non-parole period. A detailed examination of ‘like’ cases to implicitly suggest that a particular sentence is the correct one or that the sentence should fall within a very narrow band, is not permissible. Sentences imposed in other cases are not precedents which must be applied unless they can be distinguished: R v Fong  NSWCCA 320. Where principles of parity do not apply, they are not to be regarded as some sort of ’benchmark’ which is determinative of the sentence to be imposed. To attempt to so utilise other cases within a particular category involves the unwarranted assumption that all of the relevant factors which bore upon the imposition of those comparative sentences can be identified and weighted. There may be many reasons why the sentences in those cases should not be viewed by the sentencing judge as an appropriate sentence, or even a guide. Because of the dissimilarity in the offending conduct in other cases and the matters personal to the offenders, it would be an error to directly compare the sentence under challenge with that imposed in other cases: R v Morgan (1993) 70 A Crim R 368. To undertake and utilise a comparative analysis, whether at first instance or on appeal, in an attempt to identify a sentence in a ‘like’ case that is a fair comparison, is calculated to introduce a level of mathematical precision inimical to the instinctive synthesis. Where the parity principle is not enlivened, recourse to other cases is not undertaken to strike some equality with another particular sentence. Consistency is to be achieved by the application of the appropriate range and not from the application of single instances of ‘like’ cases. The adoption of a sentence selected by an earlier court, even if the case is very similar, would be to sacrifice the proper exercise of judicial discretion in pursuit of consistency of sentencing: R v Fong  NSWCCA 320. It is no part of the sentencing task, or the assessment of a sentence on appeal, to embark upon that level of analysis of comparable cases. However, there has been an increasing tendency to overlook these limitations. Accordingly one must be wary of attempts to examine a comparable case in ‘micro detail’ (KC v The State of Western Australia) as such an approach will ordinarily be indicative of an intent to use the case as providing something more than a guide to a range. It is necessary to restate that the practice, which appears to have developed in recent times, of approaching sentence appeals by a search for, and comparison with, sentences passed in other cases, is neither helpful nor justified by authority: see R v Morgan (1993) 70 A Crim R 368; R v Salameh NSWCCA 9 June 1994 and R v Trevenna  NSWCCA 43; (2004) 149 A Crim R 505 at  to  per Barr J. At the most, other cases can do no more than become part of a range for sentencing, which in the case of manslaughter is wider than for any other offence. The difference in objective and subjective culpability, which is found in these decisions, is such that any search for a correlation between the case at hand and another decided case is to ignore the judicial discretion which is involved in the individual sentencing exercise required. On appeal, the question is not whether the sentence under challenge is more or less severe than some other sentence that is within the range, but whether the sentence falls within the range of sentences that are appropriate to the objective gravity of the offence and to the matters personal to the offender. The applicant did not confine the use to be made of comparable cases to providing a guide as to the range of sentences that were appropriate. An attempt to demonstrate that within the determined category - the worst category of the offence – there were worse cases which had attracted the same sentence or that there were cases no worse which had attracted a lesser sentence, does not disclose whether the challenged sentence is unreasonable or unjust. Here the applicant invited a comparison of non-parole period sentences in ‘like’ cases. It is to be remembered that the minimum term provides for mitigation of the punishment of the prisoner in favour of his rehabilitation through conditional freedom, when appropriate, once the prisoner has served the minimum time that a judge determines justice requires that he must serve having regard to all the circumstances of his offence: Power v R  HCA 26; (1974) 131 CLR 623, 629 (Barwick CJ, Menzies, Stephen and Mason JJ); R v VZ  VSCA 32; (1998) 7 VR 693, 697 Consequently, an attempt to compare sentences in terms of the minimum periods imposed will be of even less utility, as the nature of the offence does not assume the same importance which it has when the head sentence is determined, while the personal circumstances of the offender will generally be given greater weight than when fixing the head sentence. Under ground 3 in its notice of appeal, the Crown contended that current sentencing practices in respect of the offence of attempted murder are inadequate. However, at the hearing, at the outset of making his submissions, senior counsel for the Director informed the Court that it wished to abandon this ground of appeal. The reason given was that this Court should not take into account the inadequacy of current sentencing practices when this was not a matter that had been raised before the sentencing judge. It is correct that this Court would not in re-sentencing an offender take into account the fact, if it be established, that current sentencing practices for that offence were inadequate if such a contention had not been disclosed to the offender before his plea: DPP v CPD (2009) 22 VR 533, 549; Winch v The Queen  VSCA 141 (Unreported, Maxwell P, Ashley and Redlich JJA, 17 June 2010) . Here the applicant pleaded guilty to counts 4 and 5 and he was entitled to assume that he would be sentenced in accordance with current sentencing practices. It would work a great injustice if on appeal this Court were to impose a higher sentence than could reasonably have been anticipated when considering whether to plead guilty. There may be circumstances in which the sentencing judge or this Court would not be precluded from considering and commenting upon the adequacy of current sentencing practices were the Director to make submissions supported by appropriate materials which permitted conclusions to be reached. The experience of this Court however is that on a Crown appeal, a ground of appeal asserting that current sentencing practice for a particular offence was inadequate, when raised, has been consistently abandoned by the Director at the commencement of the appeal. That, of course, is entirely a matter for the Director. But it can be said that where it is appropriate for the Director to advance an argument as to current sentencing practices, it ought be advanced before the sentencing judge or this Court depending on the circumstances, and not elsewhere. 55 There is a very wide range of circumstances attending an offence of wounding with intent to cause grievous bodily harm, particularly in relation to the severity of the wound, the manner in which it was caused and the reason it was caused. The extent of the grievous bodily harm intended, if discernible, and any relationship between the perpetrator and the victim are further variants. Accordingly, I am of the view that considerable caution needs to be applied in considering statistics for such an offence. To focus on the result of the sentencing task, to the exclusion of the reasons which support the result, is to depart from fundamental principles of equal justice. Equal justice requires identity of outcome in cases that are relevantly identical. It requires different outcomes in cases that are different in some relevant respect. Publishing a table of predicted or intended outcomes masks the task of identifying what are relevant differences. Further, to attempt some statistical analysis of sentences for an offence which encompasses a very wide range of conduct and criminality (as the offence now under consideration does) is fraught with danger, especially if the number of examples is small. It pretends to mathematical accuracy of analysis where accuracy is not possible. It may be mathematically possible to say of twenty or thirty examples of an offence like being knowingly concerned in the importation of narcotics where the median or mean sentence lies. But to give any significance to the figure which is identified assumes a relationship between all members of the sample which cannot be assumed in so small a sample. To take only one difficulty, why were the highest and lowest sentences set as they were? Do they skew the identification of the median or the mean? The task of the sentencer is not merely one of interpolation in a graphical representation of sentences imposed in the past. Yet that is the assumption which underlies the contention that sentencing statistics give useful guidance to the sentencer. It's against this backdrop that Hili v The Queen; Jones v The Queen  HCA 45 was decided, and handed down this week. Both appellants were targets of the Commonwealth‘s Project Wickenby. They pled guilty in the District Court of New South Wales to federal offences committed in evading income tax. The Commonwealth DPP appealed their sentences on the ground of manifest inadequacy and the Court of Criminal Appeal in NSW increased their penalties. The appellants sought to challenge that increase. The High Court dismissed the appeals. While the decision related specifically to federal sentencing principles, the Court restated its doubts about the usefulness of raw sentencing data in arriving at appropriate sentences. The mathematical approach to fixing the period to be served in custody that was urged in the Court of Criminal Appeal (and maintained on the applications to this Court) was advanced as a means of ensuring consistency in the sentencing of federal offenders. How is consistency in federal sentencing to be achieved? Consistency is not demonstrated by, and does not require, numerical equivalence. Presentation of the sentences that have been passed on federal offenders in numerical tables, bar charts or graphs is not useful to a sentencing judge. It is not useful because referring only to the lengths of sentences passed says nothing about why sentences were fixed as they were. Presentation in any of these forms suggests, wrongly, that the task of a sentencing judge is to interpolate the result of the instant case on a graph that depicts the available outcomes. But not only is the number of federal offenders sentenced each year very small, the offences for which they are sentenced, the circumstances attending their offending, and their personal circumstances are so varied that it is not possible to make any useful statistical analysis or graphical depiction of the results. The consistency that is sought is consistency in the application of the relevant legal principles. And that requires consistency in the application of Pt IB of the Crimes Act. When it is said that the search is for "reasonable consistency", what is sought is the treatment of like cases alike, and different cases differently. Consistency of that kind is not capable of mathematical expression. It is not capable of expression in tabular form. That is why this Court held in Wong that guidelines that the New South Wales Court of Criminal Appeal had determined should be used in sentencing those knowingly concerned in the importation of narcotics were inconsistent with s 16A of the Crimes Act. Those guidelines had made the weight of the narcotic the chief factor determining the sentence to be imposed, thus distracting attention from the several considerations set out in the non-exhaustive list of matters prescribed by s 16A(2) as matters "the court must take into account" in fixing a sentence, if those matters are relevant and known to the Court. ... in exercising its discretionary judgment, the primary duty of a sentencing court is to be true to its own perception of what degree of severity or leniency is appropriate. If the position were otherwise, a later court would be compelled to impose sentences on offenders which it thought to be too harsh or too lenient merely because earlier courts had followed that path, even though the question whether a sentence should be heavy or light is not a question of law. This would be a novel application of the doctrine of precedent. For a "sentence itself gives rise to no binding precedent. What may give rise to precedent is a statement of principles which affect how the sentencing discretion should be exercised": Wong v The Queen (2001) 207 CLR 584 at 605  per Gaudron, Gummow and Hayne JJ. It's particularly interesting to read these remarks in light of the recent attempts by the Victorian DPP to challenge current sentencing practices. I'd be surprised if this decision had a significant impact on the Director's challenge to current sentencing practices. After all, the High Court made it very clear that the proper starting point for determining the appropriate sentence is the statute that governs sentencing powers. In Victoria, that includes the obligation on courts to take into account current sentencing practices. There is no similarly worded provision in the Commonwealth Crimes Act and no general legislative command to achieve consistency of sentences that I could find. This means that there is an added form of consistency that is required when sentencing for Victorian offences. The High Court's judgment at  also makes the interesting point that judges when sentencing for federal offences shouldn't be distracted or influenced by provisions that would apply if the offence wasn't a federal offence. This, to me, clearly indicates that federal sentencing operates on its own rules and local obligations or expectations (such as a norm for non-parole periods as a proportion of the head sentence) do not affect the operation of federal provisions. The end result, I suspect, is that the life of judges who have to sentence for federal offences just became harder. They now have to consistently apply vague principles in a manner than cannot be precisely quantified and shouldn't seek guidance on the end result from statistical tables indicating any sort of 'norm' or average sentence. I agree with you about the limited application of this decision to state sentencing. The Court kept referencing federal offenders and federal sentencing (sometimes on every line), probably to avoid upsetting the apple-cart. I also agree with your observations about the Court's statements that federal sentencing should be quarantined from considerations that would be applied in a state sentencing hearing. I do find the case thought-provoking from a legal theory (rather than legal practice) perspective. If sentencing is the exercise of a discretion (a decision upon which reasonable minds can properly differ) then it follows that direct numerical comparison between a sentence in a particular case and any other case (except perhaps a co-offender) is like comparing apples and oranges. As the High Court points out in Wong, the underlying assumption of a review of sentencing statistics is that all of the cases will share similar features, though that is impossible to confirm and highly unlikely to be so. 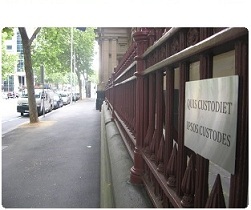 Victorian courts are obliged to recognise current sentencing practices. I don't know why that term has been interpreted (in DPP v CPD and elsewhere) to mean raw sentencing statistics. I haven't been able to pin-point when that trend started. An equally viable interpretation would be the approach taken to federal sentencing in Hili & Jones where the kind of consistency required is measured in the application of legal principles rather than arrival at particular results. Spot on, Doc. Appeals based on 'manifest excess' and 'manifest inadequacy' have become so common now that, whether they are handed down in the Magistrates', County or Trial Division of the Supreme Court, convictions look provisional until reviewed by an appeal court. A sentence is supposed to mark the end of criminal proceedings, not the close of Act I. The Court of Appeal routinely engages in what used to be referred to as 'sentence tinkering', finding minor excuses to re-open their sentencing discretion, and moving penalties and parole dates backwards and forwards by a couple of months to suit its own finely nuanced sense of justice. I assume you know about Ludeman, Thomas v French v R where the court has just granted itself the right to alter sentences on individual charges it considers incorrect, even where it makes no practical difference to the penalty imposed. It's on my reading list, Alan. I'm not quite as critical of the Court of Appeal. There have been many instances where the justices have been tempted to interfere one way or the other, but have restrained themselves and left the sentencing judge's discretion intact. I haven't checked any of the older textbooks to know where the trend truly started, but the Victorian Sentencing Manual traces the use of other cases to inform the notion of consistency of sentence to some cases in the 1980s - Oliver (1980) 7 A Crim R 174 and Zakaria (1984) 12 A Crim R 386. The problem I have with the High Court's approach to consistency is that it is hard to distinguish it as a goal or principle distinct from the rule of law itself. If the reference to current sentencing practices in the Sentencing Act was no more than a command to apply the same principles that other courts are using, then I wonder why you need a legislative command to apply the Act and any residual common law. In contrast, taking it to require courts to consider the 'going rate' or tarrif gives the provision some work to do. The statements in Hudson though are interesting as they suggest a swing away from both raw sentencing data and relevant case comparisons. When counsel started using raw data (such as Sentencing Snapshots), the courts would sometimes reject that on the basis that it didn't inform where on the scale of seriousness the particular offence lay. In response, counsel searched for comparable cases to found an argument that the particular sense was out of line with those other cases. Courts then either accepted the availability of the comparison or, sometimes analysing in micro detail, rejected the validity of the comparison. Now, the Victorian Court of Appeal is taking a stronger stance against comparison at all, it seems. The problem then becomes how to identify 'current sentencing practices' and, when the various principles cannot be mathematically evaluated, how you go from a set of principles to a figure? All this ocurring in a context where it is widely accepted that the maximum penalty provides only limited guidance on the actual sentence to impose in a particular case. I don't have any answers there, but I can't help but feel that the current approach is making things harder for sentencing judges, especially inexperienced judges or those with a civil background who don't have the instinctive grounding in what the current practices are.